In the Rodolfo family (not Rodolfe) the skill has been passed down from generation to generation. It all started in 1935! Pierre, the grand father is locksmith and opened his first shop at the avenue Marius Monti in Cannes. Henri, one of his son followed the father’s path as locksmith; when Joseph, whom everyone calls “Jo”, opts for boiler making. This new direction allowed him to specialise in the production of steel structures on boats. The two brothers’ workshops ideally complement one another until the third generation of Rodolfo, Etienne and Daniel, Jo’s sons, came at the wheel of the boilermaking structure. 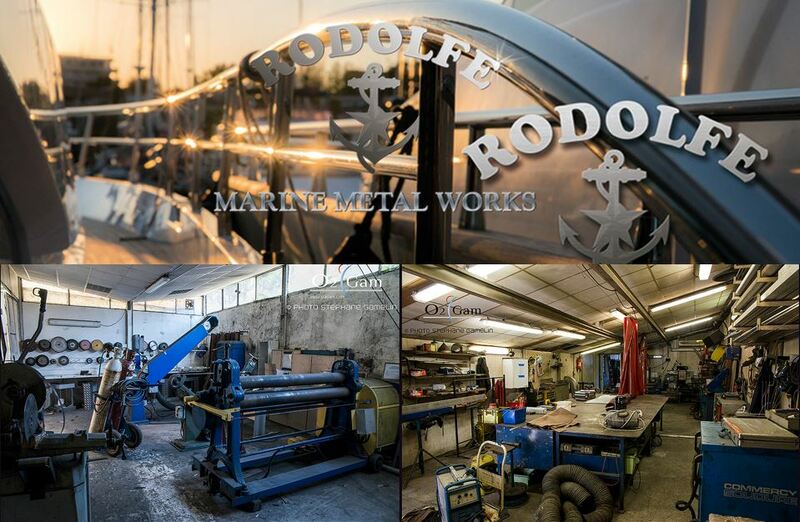 83 years of existence for Rodolfe Marine Metal Works during which the family business from Cannes always kept its promises in terms of reliability and quality of its work. Known and recognized as marine piping system specialists, such as exhaust and other tanks, the Rodolfo Brothers expanded their expertise to the production of various architectural elements (ladders, columns, railing…). This tailored original work is adapted to the nautical decoration but not only … “We would like to open a niche in the real property, proposing the production of grids, portals, ramps, stairs, strapping for gardens” says Etienne. “This “overland route” would complete their main activity, marine boilermaking. Their experience and dedication are greatly appreciated at the Port Camille Rayon. The Rodolfo Brothers have an established collaboration for many years “We are working smoothly with the management of the Port Camille Rayon and we lately furnish them metallic steps to harmonise the quays. We also come at the request of the boat’s owners as they know we ‘re making custom made pieces that we shape from A to Z down to the installation” says Etienne Rodolfo. A reputation for quality that this company from Cannes has maintained for 3 generations, soon 4, as Mathis and his cousin Quentin, after they followed the curriculum of “Compagnon du Devoir”, are ready to carry on the family tradition.